Rim of the Well performs a unique brand of Flamenco Fusion featuring the unusual timbral combination of guitar (Steve Mullins), marimba (Doug Walter), violin (Rebecca Oertli or Sandra Wong), and percussion (Rebekah West, Brett Bowen, or Jeffrey Rogers). 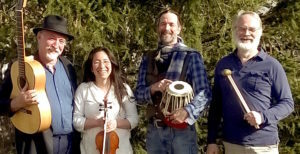 They perform compositions by Steve Mullins derived primarily from Spanish Flamenco, but with Eastern European, Latin American, jazz, classical, and other influences. There is no other flamenco group in the world with a sound quite like this! 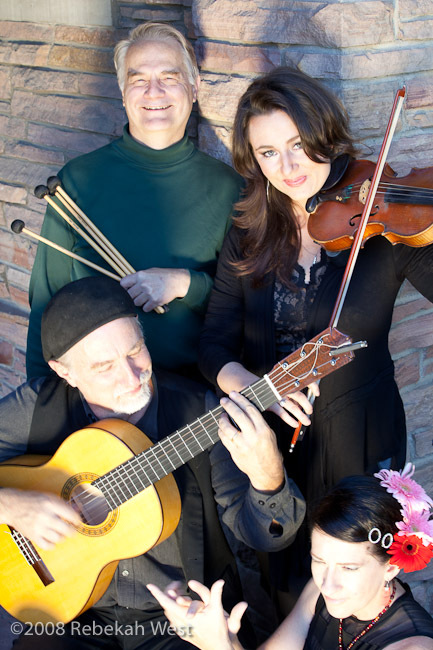 The band gets its name from the writings of Federico Garcia Lorca who describes art and the creative process as something that requires risk-taking and danger, dancing, as it were, on the “rim of the well,” with the ever-present possibility of the plunge. The original Rim of the Well ensemble with Steve Mullins, Doug Walter, Rebecca Oertli, and Rebekah West.